…these are my greatest achievements ever. Goal setting gives me something to do and something to aim for. Most importantly it gives me a sense of achievement at a time when it would be so easy to become despondent. They are not the goals of a ‘normal’ person or the goals the ‘Old Anna’ would have set for herself. They are the things that were taken for granted before. They are the things that one should be able to take for granted. Today I can tick off my first goal. It is as ‘straightforward’ as getting out of bed. There are some days when I am too poorly, weak and fatigued to accomplish this. My next target is to have a shower. There is no set time at which I have to achieve my goals. My brain doesn’t respond well to deadlines. Today, for example, I may not manage a shower until this evening, if I manage one at all. It is looking like a pj day. The nausea and dizziness that had taken a back seat for a week or two has returned and the ever-present fatigue is winning the battle today. It is rarely, if ever, a case of mind over matter with this condition. Don’t you think we’d be better by now if it were?! I won’t give up though. I won’t become despondent and question what the point of getting up is when I am too poorly to do much else afterwards. I am not depressed. I have worked too hard at retraining my brain to give up now. Pj days were always a lovely treat at university when we could slob around and stay in bed all day if we wanted to. that ‘s not how they are now. Now though, my bed is both my haven and my prison. It is the place I have to return to when the symptoms will not allow me to be anywhere else. Like I said though, I am out of bed today and have made it downstairs, another target can be ticked off. If I have to return to bed, I have to return to bed. It doesn’t matter. Tomorrow is another day. 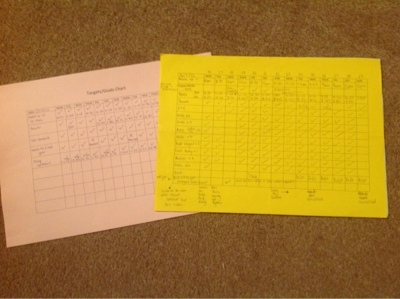 My target sheets have allowed me to see the progress that I have made since I first became ill. I started doing them in January 2011 before I had even been seen by the CFS clinic. My daily targets now include the stretches I mentioned in my post about exercise. Making my own cup of coffee is also on there, as is getting some fresh air every day, even if I only stand at the back door or open my window for a little bit to blow the cobwebs away. I do not manage to tick every box every day, but just the fact that my list of goals is longer than it was over 18 months ago shows progress and improvement physically. The target sheets also show how my hands have regained some of their strength. My handwriting has returned to that of the ‘Old Anna’ for the most part. For so long it had become a tiny, faint scrawl across the page. Next The big, wide, world!